Petit & Dommershausen, SC’s team of experts and family lawyers are adept at breaking down the strengths and weaknesses of every case, no matter how detailed or complicated it becomes. We’ll be sure to fully analyze your situation before offering you appropriate recommendations for your next step. Going through an Appleton Divorce? An Oshkosh custody battle? At Petit & Dommershausen, SC, our family law division is well known for providing knowledgeable legal advice. We provide effective representation when you need it most. Divorce Lawyers here to help. When it comes to your most personal disputes, our lawyers are always available with sound and sensible legal counsel. Whether you are considering filing, in the midst of a legal battle, at a stalemate in negotiations or anywhere in between, consult with our attorneys to ensure that your rights are protected. Our team has helped many people. We can help you. Whether your best route to resolution is mediation, arbitration or courtroom proceedings, we have the professional representation you need to give you peace of mind. We work with you to quickly secure the outcome you seek. Contact us today to address divorce, child support, child custody and placement, and more. An experienced Divorce Lawyer can help you. Many times, potential clients call to ask whether or not they need an attorney. Our standard response is that while that is your decision, divorce can have many ramifications for your financial and emotional well-being including dividing assets, bills and personal property; the awarding of maintenance (i.e. spousal support or alimony), child custody and child placement that a skilled attorney or mediator can help resolve. Although friends and relatives may have good intentions, their advice is without proper training and is likely to be inaccurate even when based upon their personal experiences. Circumstances in their cases may have been far different from those in your case or the laws may have changed since their divorce. It is like using another’s eyeglasses–they rarely fit properly. Which Divorce Lawyer is Best for You? When a person’s future is in the balance, experienced and skilled representation can make the difference between an outcome that you are satisfied with and one that can make your life more difficult for many years to come. A skilled attorney can also help eliminate some of the unknown and often overlooked consequences that can occur if someone is not represented by counsel or is represented by counsel that is not well versed in divorce and family law matters. After a divorce, a trial court can modify certain orders such as child support and physical placement; although in most circumstances you must show that a substantial change in circumstances has occurred since the current orders went into effect; however, the orders regarding property division usually cannot be changed, once the orders are approved by the court. While you are here, please review another recent excerpt from our divorce blog. Determine your filing status. Your marital status at the end of the year determines how you file your tax return. If you were divorced by midnight on December 31 of the tax year, you will file separately from your former spouse. If you are the custodial parent for your children, you may qualify for the favorable head of household status. If not, then you will file as a single taxpayer, even if you were married for part of the tax year. Consider the tax implications of support. Child support is not deductible to the person who pays it, but maintenance is. Likewise, the recipient of maintenance must claim it on her tax return, but child support isn’t reported as income. If you rolled your support together into “family support” in your agreement, that makes it fully taxable to the recipient and deductible to the payer, just like maintenance. Contact us at (920) 739-9900 today to learn more. Seek proper legal representation (i.e., retain a local attorney who specializes in divorce or family law). Discuss your divorce problems with your attorney only — not with others, although they may inquire. Friends and relatives may have good intentions, but their advice may be inaccurate even when based upon their personal experiences. Circumstances in their cases may be far different from those in your case or the laws may have changed since their divorce. It is like using another person’s eyeglasses; they rarely fit properly. Follow the court orders exactly. If you have custody of your child(ren) and your spouse has placement rights, have your child(ren) dressed and ready for your spouse at arranged times. Do not alienate the child(ren) from your spouse. That is the most trying thing for children. Do not discuss your marital problems with them. They should not feel a necessity to side with either parent. Children should love both parents. Anything you can do to make a shared placement arrangement more pleasant is for their benefit. Do not use the occasion for conflict. Do not involve yourself in domestic disputes. Do not touch, push, hit or threaten your spouse. If you cannot control your temper, take timeouts and stay away from him or her. If the police are called, it is likely that one of you will be handcuffed and taken to jail. Try to protect your credit. Contact the three credit bureaus and ask them not to allow any credit to be issued in your name. They will often put a flag on your account so that your spouse cannot take out additional credit that you are unaware of. For information on legal terms and jargon, please reference our glossary. Interested in more information for parents during very difficult times? Please visit UpToParents an organization designed to show separated and divorced parents how to build their better futures by focusing on meeting their children’s needs. Establishing paternity is the determination of who is a child’s the legal father. Paternity is only established when the parents are unmarried. If the mom is married, the law presumes that her husband is the father though this presumption can be overcome. The parents can sign this form at the hospital. It should only be signed if both parties are sure the man is the father. If there is doubt, the form should not be signed as this is a legal acknowledgement of fatherhood with all the rights and responsibilities that goes along with it (either party may want to consult a lawyer to fully understand all the ramifications of this form); however, the signing of this form does not automatically convey custody or placement rights-a court must do that unless the parties file a formal agreement. Until an order is issued or an agreement is filed with the Court, mom has sole custody and placement. Generally, a hearing will take place to determine who is the father of the child if a VPA is not filed. Either party may ask the Court to do a DNA test to confirm or determine who is the father. After the father is determined, the court will hear arguments and then issue an order on legal custody, a placement schedule and child support. If the parties do not agree with the order, mediation will be ordered and/or a Guardian ad Litem appointed. If you need to establish paternity, please give Petit & Dommershausen a call today at 920-739-9900. Tajara Dommershausen is a founding partner at Petit & Dommershausen, SC. Her practice focuses primarily on family law including divorce, paternity, custody, child support, maintenance and property division. She practices in a wide range of counties throughout Northeast Wisconsin, including Outagamie, Winnebago, Waupaca, Calumet and Fond du Lac counties. QUESTIONS REGARDING CHILD CUSTODY, CHILD SUPPORT, OR PATERNITY? We always have your family’s best interest in mind, which is why we are sure you’ll be pleased with our compassionate and exceptional legal team. Contact us today. In addition to the traditional divorce litigation representation, both collaborative divorce and divorce mediation services are ways to proceed with a divorce in a much less aggressive manner. As a divorce mediator, I do not take a side. My role is to help a couple to communicate and arrive at mutual agreements. Through mediation, you may be able to resolve disputes faster, with less bitterness, and at less cost than battling in court. The mediator can provide information about the divorce process and guide a discussion to help resolve issues. I do not represent either party and cannot provide legal advice. The couple can hire me as a mediator if you have an attorney or if you are not represented by an attorney at all. During this process, the parties may communicate with one another directly in the presence of the mediator. The goal of mediation is to allow parties to reach agreements that meet the needs of both parties and their children without the financial and emotional cost of a court battle. In contrast to my role in both the traditional litigation model or as a divorce mediator, as a collaborative attorney, I function as settlement specialist rather than adversarial advocate or mediator. The process requires both parties and their attorneys to actively listen and understand the other’s interests, needs and goals since progress is made only when all parties work together to reach agreements within the collaborative framework. If an agreement cannot be reached, both attorneys must withdraw from representation in order to go forward in litigating the divorce. Whatever method you chose, having an experienced professional on your side makes the trauma of a divorce less. Let my office help you. Call us today for assistance with your family law needs. The adoption process is complex and you will need a knowledgeable attorney to inform you of your legal options along the way. You can be sure that when you choose Petit & Dommershausen, SC you’re choosing a team of attorneys that have a deep understanding of the adoption process in Appleton and Oshkosh. Our goal is to build relationships with all of our clients that foster confidence, peace of mind and informed decision making. Our legal team can help you today. No matter where you are in the adoption process, contact us today for a better understanding of your family’s legal rights and options. You will be glad you did. We are here to help you and your family. We have assisted many families in Appleton, Oshkosh, Neenah, Menasha and the rest of Northeast Wisconsin. Termination of Parental Rights, whether voluntarily or involuntarily, is used for unfit parents who cannot care for their child. Parents give up the right to make decisions for their child and that can include religion, healthcare, education and more. Quality legal representation is available at Petit & Dommershausen, S.C.
Child In Need of Protection Services is used in court when a child has been neglected or hurt by their parent. The child will be taken from their parents and kept safe by living with relatives or a foster family. The judge may then work with the parent to get their act together and the child can subsequently go back to living with their parents. 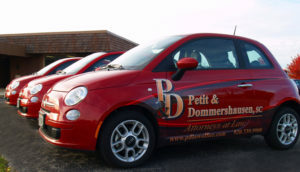 A team of skilled lawyers who can provide you with representation is available at Petit & Dommershausen, S.C. There are several types of guardianship. Petit & Dommershausen, S.C. can help you with temporary guardianship of a minor or of an incompetent. Or, perhaps a permanent guardianship of a minor or incompetent person may be needed. Each type of guardianship is governed by different law. Our team can help you. (a) The child is a nonmarital child whose parents have not subsequently married each other. (b) Except as provided in sub. (4), the paternity of the child has been determined under the laws of this state or another jurisdiction if the grandparent filing the petition is a parent of the child’s father. (c) The child has not been adopted. (d) The grandparent has maintained a relationship with the child or has attempted to maintain a relationship with the child but has been prevented from doing so by a parent who has legal custody of the child. (e) The grandparent is not likely to act in a manner that is contrary to decisions that are made by a parent who has legal custody of the child and that are related to the child’s physical, emotional, educational or spiritual welfare. (f) The visitation is in the best interest of the child. The P&D legal team can help you by filing a petition with the court to request the visitation rights. We can also help you through the potential mediation process or help you communicate with a court appointed Guardian ad Litem (a lawyer appointed by the court to represent the best interests of your grandchild). And if necessary, we will prepare a strong case and prepare you for a final hearing in court to help you advocate for your grandchildren. Does your grandchild have a deceased parent? The court may also grant reasonable visitation privileges to the grandparent if one or both parents of a minor are deceased and the minor is in the custody of the surviving parent or any other person. Are you a grandparent looking to become guardian of your minor grandchildren? The Family Law Legal team can help you with temporary or permanent guardianships for your grandchildren. A guardianship could be voluntary. We can assist you if your child wants to make you the guardian of your grandchild by petition to the court. We have the skill and expertise to help guide you through each step of the process. We can also help if your child nominated you guardian of your grandchild via will or estate plan. We will work to ensure that you are able to act in the best interests of your grandchild. Guardianships for minor children may also be created by the court without the affirmative agreement by a parent. We can help you petition the court for guardianship of your grandchildren in circumstances where a parent may be unable or unfit or unsuitable to continue to act. Contact the lawyers at Petit & Dommershausen, S.C. for more information regarding the above information or additional information that may be applicable to you and your grandchildren. Each family is unique with individual strengths and challenges. As a result, each case is different and the above description of law may or may not be applicable to you and your family. The Family Law legal team can help you and your grandchildren in Appleton, Oshkosh, and all the rest of Northeast Wisconsin. Great Outcomes Don’t Just Happen. Contact us now. Do you own a family cottage, family cabin, or hunting land with siblings or other relatives? Would you like to ensure that these types of property remain in your family and are never subjected to divorce court? Contact Attorney Tajara Dommershausen and the rest of the Family Law team at Petit & Dommershausen, S.C. today to discuss your options.